A Youga in GTA V.. 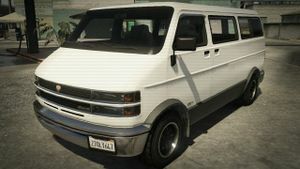 The Bravado Youga is a van in Grand Theft Auto V. It is based on the 1994-2003 Dodge Ram Van with the front end from the 1996-2002 Chevrolet Express, making the van appear similar to the Declasse Burrito in Grand Theft Auto IV. This page was last modified on 23 December 2013, at 01:20.